Chien-Shiung Wu. Image credit: via history.com. Part 4/6 of a timeline of pioneering female scientists and mathematicians, juxtaposed with a timeline of human rights. This part contains women born from 1896-1919 including Cecilia Payne-Gaposchkin, Grace Hopper, and Chien-Shiung Wu. Noddack obtained a PhD in chemistry from the Technical University of Berlin in 1919. She went on to correct Enrico Fermi’s chemical proofs in his 1934 paper on radioactivity, and was arguably the first to describe nuclear fission. In 1925, Noddack, her husband Walter, and fellow physicist Otto Berg claimed they had discovered two new elements: masurium (now known as technetium) and rhenium. Noddack was nominated for the Nobel Prize in Chemistry three times. Joliot-Curie was due to begin her bachelor’s degree at the University of Paris when World War I began. At the age of 18, Joliot-Curie joined her mother Marie Sklodowska-Curie at the Red Cross Radiology Service, which at the time, consisted of 20 mobile field hospitals directed by Sklodowska-Curie. After the War, Joliot-Curie returned to Paris to study at the Radium Institute, where she met her future husband and scientific collaborator Frédéric Joliot-Curie. Irène Joliot-Curie gained her PhD in nuclear physics in 1925, and married Frédéric the following year. The Joliot-Curies began collaborating in 1928, in order to study atomic nuclei. They were the first to record evidence of the positron and the neutron, which were interpreted by Carl David Anderson and James Chadwick. Irène Joliot-Curie showed that radioactive materials could be created artificially. Image credit: Wiki Commons/CC-A. Frédéric completed his PhD in 1930 and in 1934, the Joliot-Curies showed that radioactive materials could be created artificially. They transformed boron into radioactive nitrogen, aluminium into radioactive phosphorus, and magnesium into radioactive silicon. This allowed people to quickly create cheap radioactive materials, which could be used in medicine. The Joliot-Curies won the 1935 Nobel Prize in Chemistry for this achievement, with Irène becoming the second woman to ever win the Prize. In 1938, Irène Joliot-Curie and nuclear physicist Paul Savitch applied the same method the Joliot-Curies had used to create artificial radiation from elements like boron, to uranium. They created a new substance that was similar to the element lanthanum. This was the first step towards uranium fission, but their research was soon disrupted by World War II, which began in 1939. During World War II, the Joliot-Curies joined the French Resistance, although Irène contacted tuberculosis and spent several years in Switzerland. In 1946, Irène Joliot-Curie became director of the Radium Institute. She helped construct the first French nuclear reactor in 1948. In 1956, Irène Joliot-Curie died of leukaemia caused by exposure to radiation. She won a number of awards and medals, and now has a crater on Venus named after her. Sitterly was an astronomer who gained her first degree from Swarthmore College in Pennsylvania in 1920. She went on to assist Henry Norris Russell - known for developing the Hertzsprung-Russell diagram - at the Princeton University Observatory and the Mount Wilson Observatory. While working at Princeton, Sitterly used spectroscopy to identify the chemical elements in the Sun. She briefly left Princeton to earn her PhD at the University of California, Berkeley, before returning. Sitterly joined the National Bureau of Standards (NBS) in 1945, and soon published tables on atomic spectra and energy levels, which remained in use for many decades. She now has an asteroid named after her. Cartwright graduated with a PhD in mathematics from the University of Oxford in 1928. In the 1930s, she developed Cartwright’s theorem, which is used in signal processing. Cartwright was the first female mathematician to be elected a Fellow of the Royal Society in 1947, and became the first female President of the London Mathematical Society in 1961. Payne-Gaposchkin won a scholarship to the University of Cambridge in 1919, where she attended a lecture by physicist Arthur Eddington, who had proven Albert Einstein’s theory of general relativity earlier that year. Payne-Gaposchkin earned her degree but did not receive it as Cambridge did not grant degrees to women until 1948. This prompted her to move to the United States in 1923 in order to work at the Harvard Observatory under its new director, Harlow Shapley. It was here that she earned her PhD in 1925. This was described by astronomer Otto Struve as “undoubtedly the most brilliant Ph.D. thesis ever written in astronomy”. Cecilia Payne-Gaposchkin showed that stars are mostly made of hydrogen and helium. Image credit: Acc. 90-105 - Science Service, Records, 1920s-1970s, Smithsonian Institution Archives/CC-NC-A. Payne-Gaposchkin’s PhD thesis related the spectral class of stars to their temperature, and showed that absorption lines vary because of different amounts of ionization at different temperatures, not because of different amounts of elements, as was previously thought. She used this information to correctly predict that common elements, like silicon and carbon, are found in the same relative amounts on the Sun as on Earth, but that the majority of the Sun’s mass is made of helium and hydrogen, with much more of the latter. Astronomer Henry Norris Russell derived the same result four years later, and is often given credit for the discovery, although he acknowledged her work in his paper. After completing her PhD, Payne-Gaposchkin went on to study variable stars in order to determine how stars change over time. In 1954, astronomer Donald Menzel became Director of the Observatory. He attempted to improve the status of women at the University and, in 1956, made Payne-Gaposchkin the first female Professor in the faculty. She now has an asteroid named after her. Lonsdale moved from Ireland to England when she was five years old, and later studied at Ilford County High School for Boys, since the Girls’ school did not teach mathematics or science. She earned her bachelor’s degree in physics from the University of London in 1922, and her master’s degree from University College London in 1924. Lonsdale then joined the crystallography research team at the Royal Institution of Great Britain, which was headed by physicist William Henry Bragg. Crystallography is the science that examines the arrangement of atoms in solids. Lonsdale became a pioneer of X-ray crystallography and the first female Professor to gain tenure at University College London. In 1966, she was elected the first female president of the International Union of Crystallography, and she was elected the first female president of the British Association for the Advancement of Science (BAAS) the following year. Way gained her first degree from Columbia University in the United States in 1932, and earned her PhD at the University of North Carolina, where she was supervised by John Wheeler. She joined the Manhattan Project in 1942, working for Wheeler with physicist Alvin Weinberg. Way used data that had been compiled by physicist Enrico Fermi in order to show that it’s possible to create a self-sustaining nuclear chain reaction. Her calculations were used to construct Chicago Pile-1, the world’s first nuclear reactor. She also worked with physicist Eugene Wigner to develop the Way-Wigner approximation for fission product decay. Way co-edited the 1946 bestseller One World or None: a Report to the Public on the Full Meaning of the Atomic Bomb. This contained essays by physicists such as Niels Bohr, Albert Einstein, and Robert Oppenheimer. In 1949, she began to work for the National Bureau of Standards, where she helped establish the Nuclear Data Project. Way became a professor at Duke University in 1968. Hopper graduated with a bachelor’s degree in mathematics and physics from Vassar College in 1928, and a master’s degree from Yale University in 1930. She stayed at Yale, earning her PhD in mathematics in 1934, and became Associate Professor of Mathematics at Vassar in 1941. In 1943, Hopper left Vassar to join the United States Navy Reserve as one of the Women Accepted for Volunteer Emergency Service (WAVES). Hopper trained at the Naval Reserve Midshipmen’s School in Massachusetts, and graduated in 1944. She was then assigned to the Computation Project at Harvard University as a Junior Lieutenant. Here, she worked on programming the IBM Automatic Sequence Controlled Calculator (ASCC), referred to as the Mark I. Grace Hopper developed the first compiler, and was Director of the department that developed COBOL. Image credit: Smithsonian Institution/CC-A. Hopper is credited with coining the term ‘debugging’ in 1947, after a moth became stuck in a relay. The word ‘bug’ had previously been used to describe a technical error by Thomas Edison. Hopper developed the first compiler in 1952. A compiler is a computer program that transforms source code written in one programming language into another. Hopper became the Director of Automatic Programming in 1954. Her department was largely responsible for the development of COBOL (COmmon Business-Oriented Language), one of the first modern programming languages. Hopper became Director of the Navy Programming Languages Group in the Navy’s Office of Information Systems Planning in 1967. She was promoted to Captain in 1973. That year, she became the first woman, and first American, to become a Distinguished Fellow of the British Computer Society. Hopper then pioneered the use of standards for testing computer systems, working with early programs like FORTRAN and COBOL. These tests were adopted by the National Bureau of Standards in the 1980s. In 1983, she was promoted to Commodore, a position later named Rear Admiral, lower half. Hopper retired in 1986, aged 79, and was awarded the Defence Distinguished Service Medal, the highest non-combat award given by the Department of Defence. She then worked as a Senior Consultant to Digital Equipment Corporation until her death in 1992. Mayer completed her PhD at the University of Gottingen in 1931, studying under physicists Max Born, James Franck, and Adolf Otto Reinhold Windaus. After completing her PhD, Mayer moved to the United States, taking many voluntary positions before being hired as a Senior Physicist at the Argonne National Laboratory in 1946. While there, she developed a mathematical model for the structure of nuclear shells, which explained how the number of particles in the nucleus is related to the atom’s stability. Mayer suggested that the nucleus of an atom is a series of closed shells, and neutrons and protons undergo spin orbit coupling. Mayer became a Professor of Physics at the University of California, San Diego in 1960. She won the 1963 Nobel Prize in Physics for her work on nuclear shells. This made her the second (and also the latest) woman to win the Nobel Prize in Physics. Hodgkin earned her PhD at the University of Cambridge, where she was supervised by biologist John Desmond Bernal. It was here that she realised X-ray crystallography could be used to determine the structure of proteins (crystallography is the science that examines the arrangement of atoms in solids). In 1953, Hodgkin became one of the first people to measure the structure of DNA, confirming the double-helix model that had been developed by Rosalind Franklin, Francis Crick, and James Watson earlier that year. Hodgkin won the 1964 Nobel Prize in Chemistry for her work on X-ray crystallography, making her the third woman to win the Nobel Prize in Chemistry, after Marie Sklodowska-Curie and Irène Joliot-Curie. Wu began postgraduate study at the Zhejiang University for two years, before becoming a researcher at the Institute of Physics of the Academia Sinica (Central Research Academy). She moved to the United States to continue her postgraduate study in 1936. 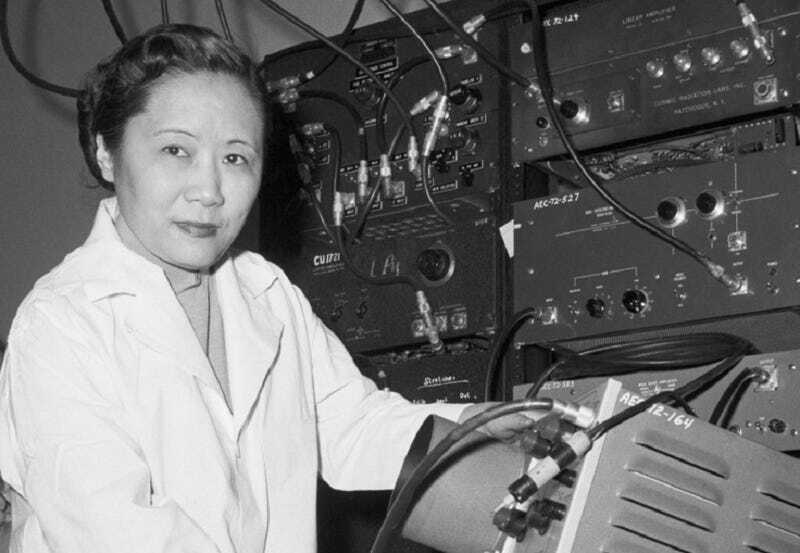 Wu joined the University of California, Berkeley, studying for her PhD under physicist Ernest Lawrence, known for the invention of the cyclotron particle accelerator. Wu graduated in 1940, and then joined Smith College in Massachusetts, followed by Princeton University in New Jersey, and Columbia University in New York City. While at Columbia University, Wu worked on the Manhattan Project, helping to develop a process for separating uranium into isotopes by gaseous diffusion. In 1950, Wu confirmed the calculations of physicists Maurice Pryce and John Ward, which are relevant to the Einstein-Podolsky-Rosen (EPR) paradox. Chien-Shiung Wu proved that parity does not apply to weak subatomic interactions. Image credit: Acc. 90-105 - Science Service, Records, 1920s-1970s, Smithsonian Institution Archives/CC-NC-A. In 1956, physicists Tsung-Dao Lee and Chen Ning Yang showed that interactions involving the weak nuclear force do not follow the same symmetry as the other elementary forces. This symmetry is known as parity. Lee and Yang designed several experiments for testing this theory, and Wu improved upon this design and carried out the experiment, proving Lee and Yang correct. These results were soon verified, and Lee and Yang were awarded the 1957 Nobel Prize in Physics for this discovery. Wu published a reference book, Beta Decay, in 1965. She became the first female President of the American Physical Society in 1975, and received the first Wolf Prize in Physics in 1978. 1918 - In Britain, women over 30 were granted the right to vote and stand as an MP.